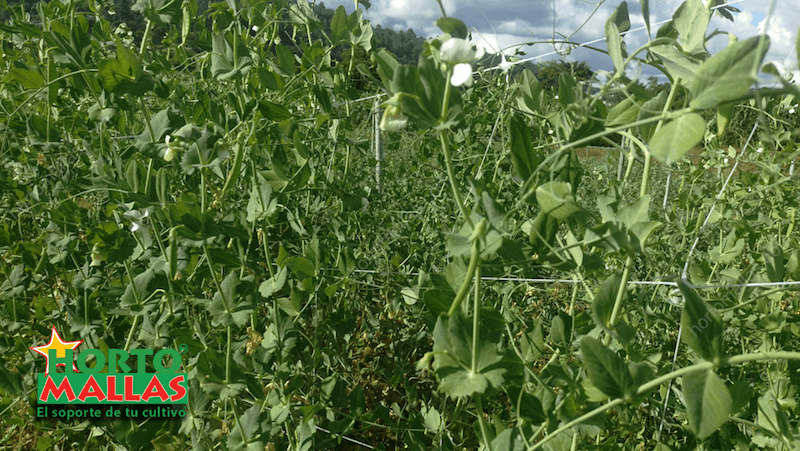 Tutoring is necessary when growing peas, as this leguminous performs best on vertical trellis or vegetable support known as pea netting. 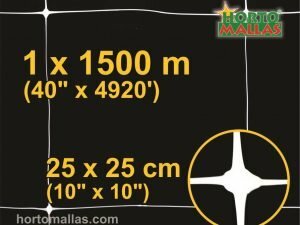 Growing on HORTOMALLAS net icreases aeration and exposure to sun ray , in turn it improves phytosanitary vegetable conditions. A healthier plant becomes more resistant to disease hence less agrochemicals need to be sprayed or injected in the irrigation system and this will reward the farmer with higher market price for an organic crops! 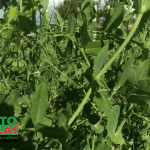 Trellis netting allows peas and snow peas plants to grow vertically and away from the humidity of the soil, this will reduce its exposure to humidity related pathogens lige fusarium, mildew and other fungi that attack vegetable plants. 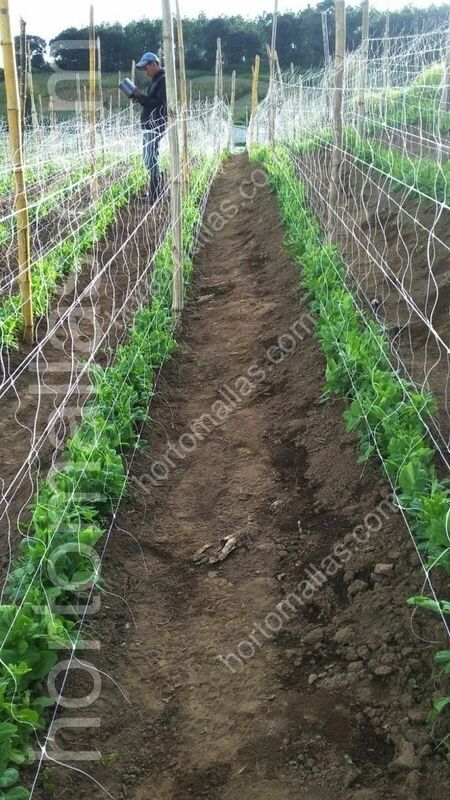 HORTOMALLAS bean netting is ideal for trellising snow peas or sweet peas. Growing peas on a net increases flowering and pollination as the flowers are better exposed to pollinating agents or wind, the other aspect to consider is plantation density, trellising on a net one can expect a higher number of plants per furrow, which all together will turn this pea net investment in your best expenditure ever! allows peas and snow peas. 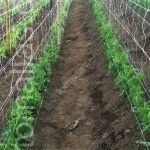 In the cultivation of peas you can use pea netting for tutoring. Here depicted is the trellis net installed as a double row. 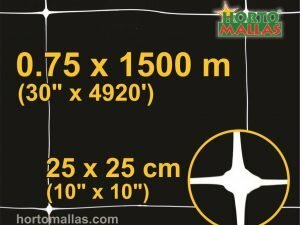 The great advantage of using HORTOMALLAS to train your pea plants is that this trellis netting will withstand many crop cycles in open field conditions, as the quality of the polymers used in this trellis netting are very high. 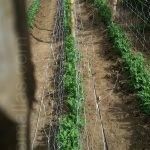 Being able to re-use the same netting many times over means being able to implement some sort of crop rotation calendar that will allow the grower to take advantage of the same infrastructure (mulch, posts, irrigation, horticulture net) for many crops. 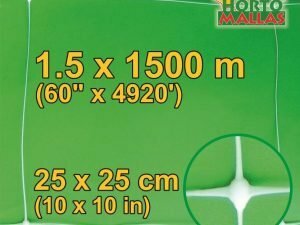 This efficiency leads to an improved economic return especially when combining crop rotation to an efficient soil nutrition plan/system, whereby alternating leguminous with cucurbits or solanaceous, keeping in mind that sanitary conditions must prevail as white fly is attracted by beans and peas. 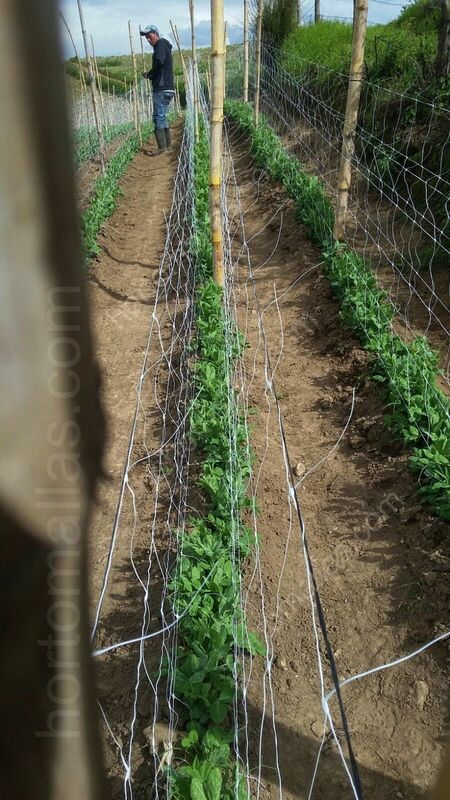 This is a case where the farmer preferred to give peas double support with pea netting, taking advantage of the nature of the tendrils naturally tied to the trellis net. This system produces more plants per hectare and better quality thanks to reduced mechanically transmitted diseases.